The controversial little country squeezed among Europe's most famous touristic powers - Greece, Italy and Croatia. And... my favorite country I have visited so far without a doubt. Ironically, most of travelers skip Albania whatsoever while traveling south to Greece. What a mistake it is! Instead of gloomy, grey, polluted and dangerous country (which is the way Albania is portrayed in the West), we came across: perfect, unspoiled, undiscovered paradise beaches with crystal clear waters that could easily compete with the ones in the tropics; spectacular mountains; unique in the world turquoise Blue Eye Spring;, delicious (and extremely cheap) food; amazing, affordable accommodation; unique, fairy-tale like architecture; cozy villages and the nicest locals we've ever met. Albania is the proof that off the beaten path travel offers more satisfaction! Scroll down to have a look at the posts describing our experiences and surprises about Albania. You can find many useful information and beautiful images in them. And, just like many of our friends, you probably will find it hard to believe the photos were taken nowhere else but in Albania - this little Balkan country is hardly ever depicted this way in the mainstream western media! Berat in Albania is called "the town of a thousand windows". And that is so true. Looking at the beautiful houses "climbing" up the steep hill around the old town, you can't help but notice the seemingly endless number windows. Because Berat is beautifully situated in the mountains, it also offers amazing bird's eye views. Both Berat and Gjirokaster (take a look at my post about Gjirokaster) are the most beautiful towns in Albania. Together with Mostar, Prizren and Ohrid, they form a district full of the distinctive Ottoman Empire architecture, unique for Europe. This region, although as rich in history and as attractive as the Spanish or Italian equivalents, receives hardly ever foreign tourists. But it's a good thing, you can explore what's best without annoying crowds and discover Europe's best hidden gem freely. Traveling along the southern coast of Albania literally made my jaw drop. I had not expected at all what I was going to see. Paradise, completely unspoiled beaches, clearest sea possible, superb food and accommodation at ridiculously low prices, friendliest locals I'd ever met... I thought nothing else was able to surprise me. Then, we reached Gjirokaster - a little Ottoman town which turned out to be breathtakingly unique not only in Albania but in the whole Europe. It could easily compete with the French or Italian equivalents - in Gjirokaster you'll see the most beautifully decorated houses covered with original stone roof tiles, authentic, perfectly well maintained old town with cobblestone, winding little streets and... literally zero tourists! After spending an amazing weekend in Ksamil and enjoying white sand beaches with crystal clear - tropical looking sea, it was time to head north along the Albanian coast and explore probably the least known riviera in Europe. Ksamil had surprised me so much with the color of water and white sand (much better than in popular Corfu) that I was sure the rest of the coast couldn't get better. During the season, the beaches at Ksamil might get busy - however, I was lucky to be there in June and it was absolutely perfect and pretty quiet. But what I was about to discover traveling north along Albanian riviera exceeded all my expectations! Cover photo: Borsh Beach. Krujë (Kruja in English) in Albania is a charming medieval village, beautifully situated among mountainous peaks and the green valley stretching all the way down to the Adriatic coast. Kruja, once inhabited by the ancient tribe of Illyrians, besides its natural charm, boasts an enormous historical importance. As early as in the 12th century, it was the center of the first independent Albanian state. The town lies on the foot of the Mount Krujë and offers spectacular views over the entire area. Although it's a popular and very easy to reach destination for a day trip from Albanian capital - Tirana, it's still very authentic - with very few foreign visitors. Many people who come to Albania stay only in Tirana and complain that there is nothing much to see there. The capital city, although interesting is not particularly beautiful and is not a great example of what Albania has to offer. 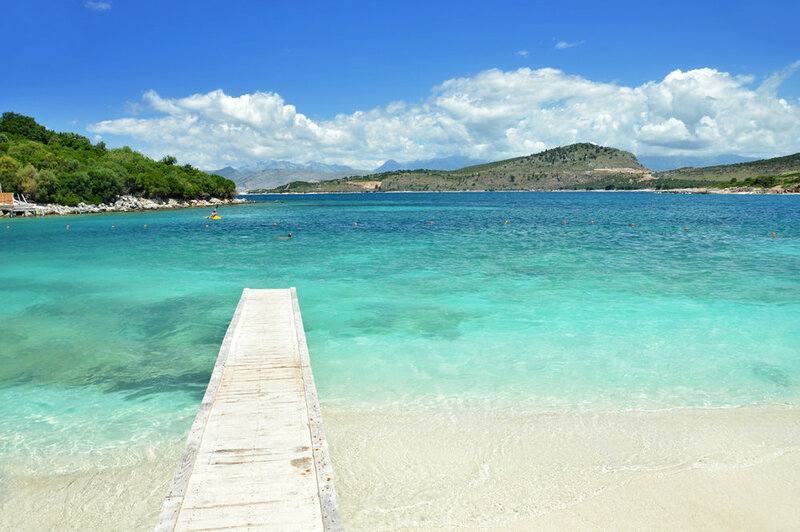 The very south corner of Albania - the country which is still a black spot on the touristic map of Europe offers, in my opinion, the best beaches in the entire old continent: white sand, tropical color of the clearest possible seas, the exoticism of the area and most friendly locals. Most of the very few individual foreign tourists who get to the beach village of Ksamil arrive by ferry from the neighboring, overcrowded by tourists Greek island - Corfu. I followed the same route. And, I really thought that Corfu is amazing until I set foot in Albania's shore. My jaw literally dropped. I immediately felt as if I was transferred to one of the tropical, paradise-like postcard spots. It's a mystery to me how this exceptionally beautiful piece of land lacks any recognition among foreigners. But maybe it's better this way! Syri i Kalter (The Blue Eye) is a fairy tale-like spring located in the south of Albania, Delvine district, near the town of Saranda. Not only the spring is the attraction but also the surrounding nature, the forest, and the clearest fresh waters I have seen in my life. Even clearer then in the becoming famous now Plitvice Lakes National Park in Croatia. You might have the impression that this place is completely unreal, out of this world, as if specially prepared for a movie set. And, I would recommend that you visit it now, before hordes of tourists find out about it, especially that Albania (although unknown) it's in the heart of Europe and quite easy to reach.